Are coyotes a duck’s best friend? Maybe not with these ducks! Photo by gainesp2003. Mesopredator release occurs when top level (“apex”) predators are killed off, and the smaller predators, whose numbers are always controlled by the apex predators, wind up expanding so much that they wind up rapidly depleting certain prey species. The phenomenon is discussed at length in William Stolzenburg’s Where the Wild Things Were (2008). The book is an account of the various ecological discoveries that have pointed to the importance of large predators in maintaining balanced ecosystem. Mesopredator release is just one of these discoveries. Stolzenburg points out several examples of mesopredator release in the text, including the discovery that coyotes are responsible for maintaining songbird diversity in suburban environment. They do so by eating house cats, which are major predators of songbirds. Coyotes are also implicated in conserving other avian fauna. Stolzenburg points out that one of the initial studies that indicated mesopredator release occurred in the Prairie Pothole Region of the Dakotas. This area was known as, to use Stolzenburg’s own words, as a “duck factory.” The wetlands of this region were home to many different species of duck, which were able to produce ducklings in very high numbers. Over 60 percent of the breeding population many common species of duck uses this region. By 1990, the region’s duck producing prowess was greatly reduced. It wasn’t until a group of researchers began examining nesting success rates in the region during the 1990, 1991, and 1992 nesting season that the reason became revealed. It turns out that red foxes were the major cause for nest failure. Red foxes are small canids that do like to raid nests and kill ducklings. Coyotes had been controlled in the region for decades, and in some areas the coyote population was quite low. And where the coyote population was low, the red fox population was high. Coyotes can suppress red fox numbers, and where there were no coyotes, the red foxes were able to breed without a high mortality rate. But it also turned out that in areas where there were no coyotes, 27% of all duck nests were raided by foxes. In areas where coyotes were present, only 4% were raided by foxes. This finding strongly suggests that mesopredator release was a major cause for the decrease in duck populations. Controlling coyote numbers caused the red fox population to skyrocket, and the resulting high numbers of red foxes resulted in more duck nests being raided. 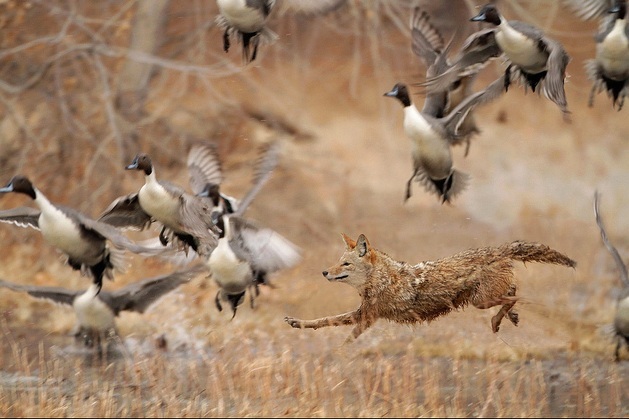 Coyotes are not really big on hunting ducks or raiding nests. They are just too big to waste time raiding nests as often as red foxes do, and their larger size requires better quality protein in the form of rabbits, rodents, deer fawns, and the occasional red fox. So in this way, coyotes are a duck’s best friend. They keep the foxes under control, so that more duck nests can be successful. Larger predators have not always been popular. We’ve killed them by the score, and so many of these predators are now on the brink of extinction. It’s only now that we’ve started to figure out how important these predators are to the ecosystems of the world. They do regulate prey numbers, but some of their prey are actually smaller predators that would destroy many different species if their numbers were left to go unchecked. With these larger predators, whole ecosystems can flourish. But of course, larger predators do cause some problems with human civilization. These problems have to be mitigated, but I don’t think anyone could ever make the case that ecosystems and biodiversity benefit from the removal of large predators. If we wish to have dynamic ecosystems, we have to consider the role that these predators play. “It’s all connected.” We need to say it again and again and again, till people hear it. Basically WE are the problem, I think.